Love Magic was the third of four series inspired by Aboriginal ritual and legend. It followed The Cord to Altcheringa (1953) and Chant for Kurdaitcha. In 1956 the artist produced the last of the set: ten large panels depicting The Legend of the Black Swan. All four series reflect Elizabeth Durack’s affinity with an Aboriginal view of the world. Using a limited palette of ochre colours she created works, striking in drama and design, that combined an essence of Aboriginality within her own perceptions and distinctive style. The works stem partly from personal experience of ceremonies, from familiarity with ancient masterpieces on rock faces in northern Australia, and from lessons learnt from Jubul, a bark painter from Arnhem Land. Essentially, the paintings are a synthesis of two worlds. Detailed notes elucidate certain aspects of them and indirectly acknowledge that not all can or need be explained. In the ordered society of the old Australian Aborigine, choice in marriage was confined within strict bounds of preordained law and formal custom. Baby girls were often betrothed from birth and, although a certain amount of choice was possible, it was limited within a fixed group. Our haphazard method of boy-meets-girl, where marriage is possible within any grade of society, was virtually unknown. Yet, while such restriction might seem intolerable, it had the advantage that no man remained unwillingly a bachelor nor any woman lived in enforced spinsterhood. In this set of pictures numbers 1-4 depict some of the well-known love charms used by the men to attract women. Pictures, numbers 5-9, relate to counter-magic and reprisal on the part of the bereft and angered mate. In the painting of the Love Magic pictures, and the other series, I have employed the Aboriginal's own method of bark painting. Modern materials have been used but, for the construction and approach generally, I am indebted to an old friend and fellow artist, Jubul, of a Northern Territory tribe, for the teaching and guidance he gave me in the last years of his life. Because of the convention of hanging pictures on walls I have kept these for the most part "right way up" although, strictly speaking, a bark painting has no right or wrong way up. It is painted to be looked at by a circle of observers on the ground and no bark painting is complete without a verbal explanation by the artist who with words fills in the gaps or the parts too "hard" to be shown. I have put more drawing (as is generally understood) into human figures than would Jubul but in regard to the building-up, the patterning, and the colour schemes, the paintings owe much to the unsurpassable originals of our great unknown native artists whose work it has been my privilege to study and revere. * These notes (and the notes accompanying each painting) come from the catalogue prepared when this series of paintings was first exhibited at Anthony Hordens Art Gallery, Sydney in November 1954. At the right time of year a charmed piece of elliptical wood is carved into a bull-roarer, and swung from a long cord. 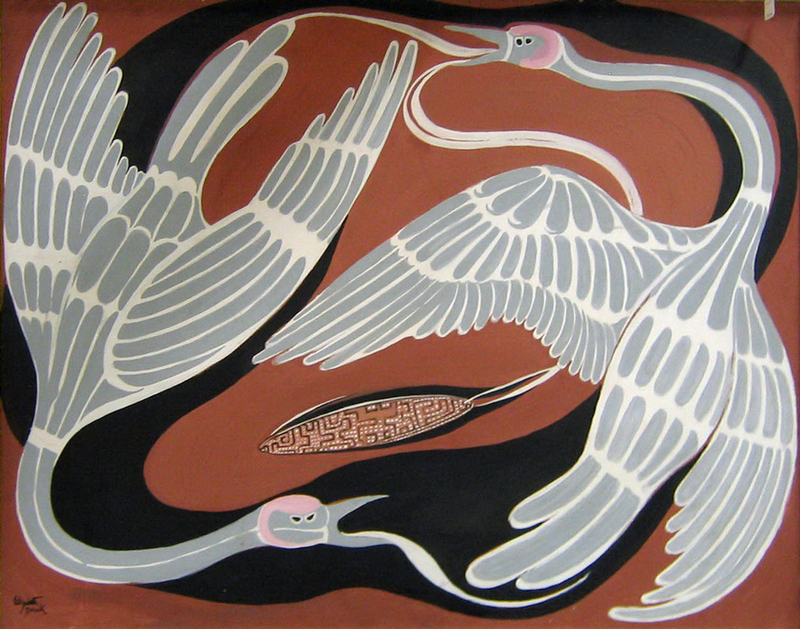 The sound that issues forth intones the note of the mating brolga and the woman, hearing it, is believed to be drawn irresistibly to the man employing this form of magic.